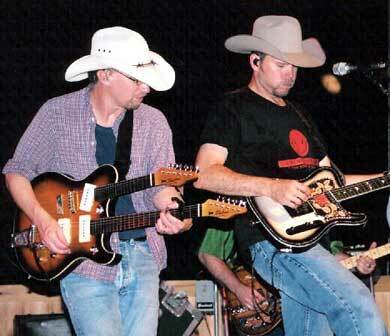 The Toyota Outback Concert series was showing on the Country Music Channel. Filmed on location in Henty featuring Tomkins guitarist Travis Collins and bassist Geoff Simpson. at the Galston Country Music festival. Now who's guitar could this be...is that a Medicine Wheel? 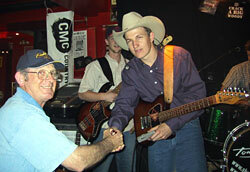 on June 9th, 2004 at The Trap in Nashville. 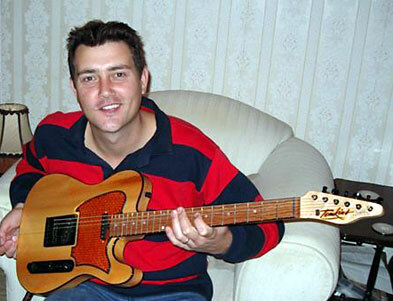 The June 2004 issue of the U.S.
with one of his Tomkins guitars. 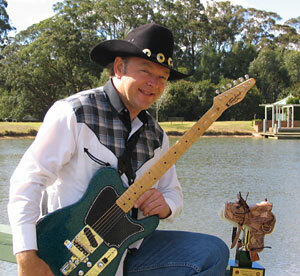 Congratulations to Australian Tomkins guitar picker JEDD HUGHES, currently on tour in the Patty Loveless band. 21 year old JEDD has signed a record deal with major US label Universal/MCA. Tomkins player EDDIE PEREZ has joined country stars THE MAVERICKS! Eddie was previously a member of the Gary Allan band. Also out now on the CD stores is a brand new local release titled the Tomkins Showcase Volume One. The CD is a compilation of guitar tunes played on local-based Tomkins guitars, made by Allan Tomkins. The CD features 24 tracks of blues and country songs and instrumentals and features such highlights as the Bondi Cigars Key to Your Heart, Bob Howe's Diamondtina Yodel, Ace Fender's Heart of Stone, Geoff Mack's I've Played Everything (a re-worded version of his penned I've Been Everywhere, made famous by Lucky Starr), Keith Glass' Sleeping Through The Storm and Lyn Bowtell's Sweet Summer Rain to name just a few. Like another local guitar luthier Frank Grubisa of Grubisa Guitar, Allan Tomkins continues to break the mass-produced guitar manufacture mould, to create distinctive quality hand-made Australian guitars. The CD is the first in what Tomkins hopes will be a continuing collection of Australia's finest players playing on Australian guitars. For further information check out the website. 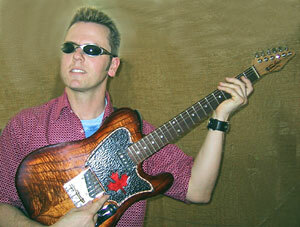 Canadian Country Music star Jason McCoy is pictured left, with a new custom-made Australian TOMKINS guitar, emblazoned with the Canadian national emblem, the maple leaf. The Tamworth 2003 Tomkins Guitar Showcase was huge! Did you see the feature articles on Tomkins guitars in the December issue of Capital News magazine and the last issue of G'day G'Day magazine? 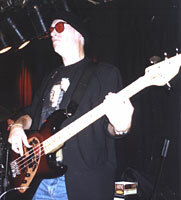 TOM HAMILTON of the legendary rock band AEROSMITH is the proud owner of a new Tomkins bass. Play For Rain: As drought conditions in outback Australia begin to reach record proportions, Steve Forde and The Flange attempted to break a world record as they combined with Australian Red Cross to alleviate some of the suffering in rural Australia by playing for rain and drowning the current watermark of 24 hours for the longest performance by a band. Newsflash...October 4th... a new world record! Steve Forde and The Flange played for 26 hours straight! 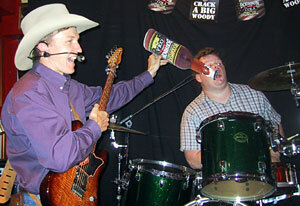 Steve Forde and The Flange are proudly supported by Tomkins Guitars and Basses. The non-stop session which lasted over 26 hours began on October 3 followed the launch of FARMHAND, a National fundraising foundation to assist drought stricken Farmers throughout Australia. The famous Bourbon & Beefsteak in Kings Cross hosted Steve Forde & The Flange's World Record attempt with all proceeds going to a special Drought Appeal to be distributed by Australian Red Cross on a National basis. cardboard bottle of beer that Steve Forde is offering him! Dale Watson at the Grand Ole Opry - In August 2001, Dale Watson and and his Lone Stars performed on the legendary Grand Ole Opry in Nashville, Tennessee. Dale played his new Tomkins Custom guitar. 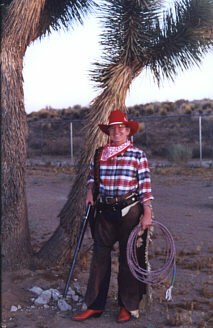 June/July 2001 - Allan and Barbara Tomkins travelled to the U.S.A. and the trip seemed to bring out the Cowgirl in Barbara! 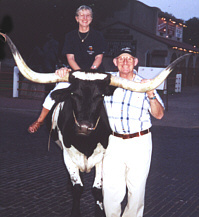 Here she is, riding a live Longhorn Steer outside the Stockyards at Fort Worth, Texas. Allan and Barbara delivered a new guitar to Dale Watson, and also got a chance to catch up with Jim Lauderdale and his guitarist (and Tomkins player) Eddie Perez. At the Crystal Palace in Bakersfield, they were welcomed by Buck Owens. They also checked out the new band Hay Bale, featuring Billy Dee (Donahue) who was Gilley's house band leader for 9 years and who plays a Tomkins Bass, and Merle Haggard's guitarist Redd Volkaert. 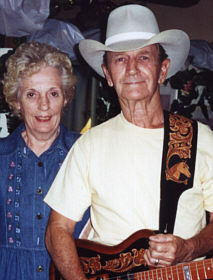 Pictured right: Cowboy Lloyd Cross and his wife Doris during a visit with Allan and Barbara. 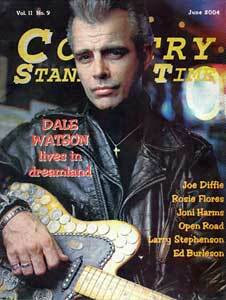 Lloyd is a master hat stylist, immortalised in the Dale Watson song, That Man in the Lloyd Cross Crease.